A firestorm has been brewing down in Jacksonville, Florida over the last day or two. 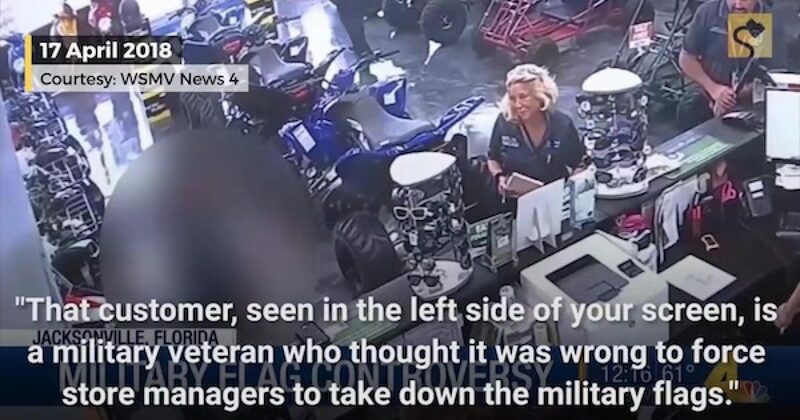 At the center of the controversy is a power sports business called Jaguar Power Sports caters to military veterans, a city employee who has no respect for America’s heroes, and an outpouring of support from patriotic Americans. Jaguar Power Sports, flies flags from each of the military branches, plus a pair of American flags and a Jacksonville Jaguars flag. According to city ordinances, the military flags were against code, which is what led city inspector Melinda Powers into their store on Monday. “She says, ‘What did you do for this country?’ He says, ‘I took three bullets to the leg. I almost lost my life for this country. I’m retired. I’m a veteran.’ She gets in his face this close and says, ‘You did nothing for this country,’” store employee Katie Klasse said. For her part, city inspector Melinda Powers said the entire situation was a catastrophic series of mistakes. She says that the flags were against code, but that the conflict in the store was just a misunderstanding, and that she has the utmost respect for our nation’s veterans. Yeah Sure, and The Lid has a full head of hair.